Great costumes I saw out in the water this morning! These swimmers really look like dolphins! They were so fast, too! Click HERE (or Below) for today's Video. Okay, okay, I admit it. This is a really stupid blog entry. Night life? Me? What night life? We had dinner out with our very good friend, Lynda, this evening and had a great time laughing and talking and laughing some more. I am amazed that this guy (me) who used to tear up the Chicago nightlife and not get in until four in the morning has become such a homebody. I really enjoyed getting out this evening, even if it was just a one time deal. Frustration! My blood is boiling at the unfairness I've encountered the past two days. Yesterday's issue of a new client claiming something that wasn't true, turned out to be a misunderstanding on their part. So this morning, all was right with the world once again. And my blood pressure dropped to normal and I stopped obsessing. This evening a huge corporation (hotel company rhyming with Riot) is demanding that I give them ownership of photographs which I took for their architect. The architect tells me that I am protected by a signed contract they have with the behemoth. I fear that I will be caught in the middle of a conflict (it has happened before) and my mind is off to the races once again. 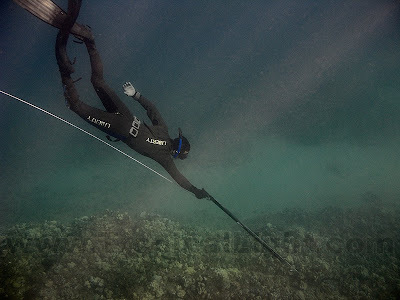 I do not touch anything while swimming except for sea water and my camera. Sometimes that means that I miss out. 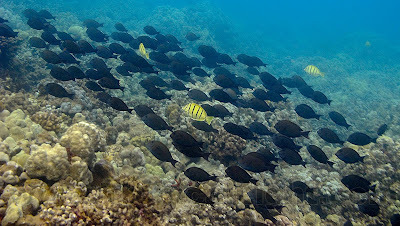 I swam up to a clustered group of snorkelers this morning and watched their guide pass around an inflated Pufferfish. The only time prior to this that I had seen a pufferfish blow up was in the animated movie "Finding Nemo". It occurs to me that much of my life experience comes from what I've seen in movies and on TV rather than from actual personal exposure. Definitely a less dangerous and more sanitary way to live. This couple looked so alone! 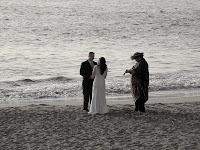 Wedding ceremonies are held on our little beach most evenings, but tonight's was the smallest I've ever seen. There is always a wedding coordinator and almost always a photographer, not to mention guests. Tonight it was only the bride, groom and officiant. I guess the economy really is taking a toll. 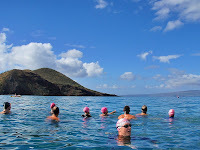 The Xterra World Championships took over our beach this morning so the Maui Pink Cap Swimmers headed over the Pali (cliffs) to Coral Gardens. 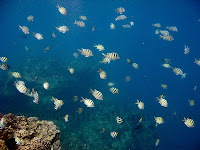 We always have fun swimming along the shore there, riding the surging swells into precarious openings among the rocks. 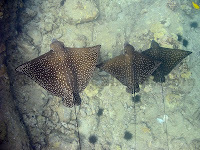 We ran into a large group of Spotted Eagle Rays and swam with them for a while. Click HERE or below for the Video of today's swim. 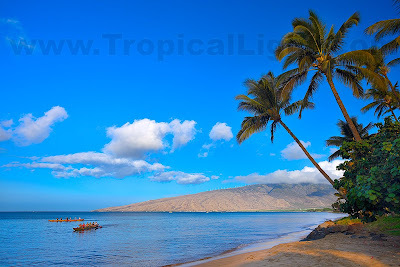 The so-called "Black Sand Beach" in Makena was closed for a year after our big earthquake. Just before it reopened I commented on the unusual profusion of fish. Lots of fish of many different species. Every time I swim over that reef I now see at least two spear fishers, often more; and very few fish. I swam by this guy this morning just as his gun went "ka-chunk" and watched him haul in one of the last parrot fish in the area. Oh, boy. Another day in front of the computer working magic. At least I managed a walk under hazy skies and a brief dip in the ocean this morning. 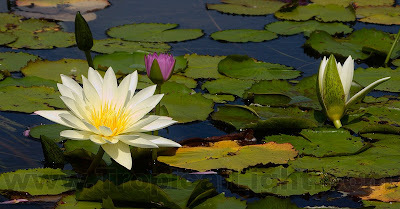 Yesterday was such a full, rich day that I was too exhausted to make a blog entry. I had an all-day photo shoot scheduled, so I splashed out for a quick swim in front of my house. 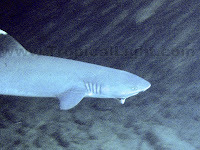 I checked out two caves and saw white tip reef sharks in each of them. One swam out twice to check me out. Because this was only supposed to be a brief swim, I only brought my smallest point-and-shoot camera (my excuse for the poor photo quality). The architectural photo shoot went well. We had clear skies for the second day in a row, hooray! When I first moved to Makena I swear it was clear every day - not so much any more. Then again, clear skies weren't as important to me back then, so I might not have paid as much attention. Then, of course, hours in front of the computer making photographs from the previous day look the way my eye saw them, not the way the camera registers photons on its sensor. Here's a little after and before example. 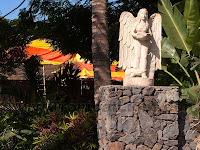 Walk-in early voting for the November U.S. elections began yesterday here on Maui. I went today at lunch time and there were no lines. I've done my part, how about you? I love the way exterminators use colorful bigtop tents to kill everything inside a house. I can just hear the neighborhood kids now, "Mommy, Suzie gets to have a cool tent on her house. Can we have one too?" "That's not a tent, Billy, that's for killing vermin." "Huh? Oh, then we should get one and invite uncle Bob over. You always call him a vermin." 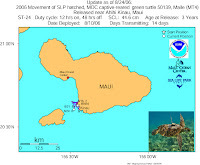 The Maui Pink Cap Swimmers gathered, but didn't go far this morning (risk of shark attack is higher when there is no visibility). Why was the water so murky? South shore surf was up, but not unusually so. Full moon was a couple of days ago, so any coral spawning should be over. 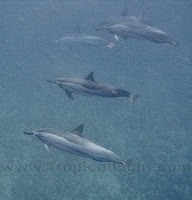 In spite of rather murky water this morning, over forty spinner dolphins managed to find me and swim with me for more than half an hour. One was very playful and kept circling me then sprinting ahead, then it would wait for me then rush ahead again. I may not be very fast but I certainly got a good workout out of the interaction. Click HERE or Below for Today's Video. This morning I made a blog video challenge to Patti. My friends Janet and Patti are traveling around Asia. They always have grand adventures: some happy, some tragic, but always (eventually) uplifting to the spirits. Selfishly, I want to share in their experiences, so I pushed them to start a blog. 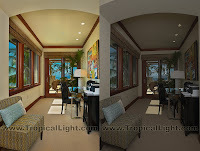 The results have exceeded expectations (click HERE for their Blog). Naturally, I couldn't leave well enough alone, so this morning I challenged Patti to post a video directly to their blog. No editing of any kind, just straight from the camera to the computer to the blog. I had a great stylist working with me on my photo shoot today. What a pleasure. Not only does she strew flower petals under my feet as I walk, but she brings me coffee and gives me shoulder rubs. Okay, I made all that up. But what she does is even better that that; she makes everything look absolutely spectacular. A new vent in the volcano on the Big Island of Hawaii has been bringing us a lot of vog (volcanic smog) recently. Exercising yesterday and today was a struggle, but the good news is that hazy conditions are perfect for flower photography. I am happy to report that my friend, turtle number 4 (sorry, I keep calling it number 5 - you know how bad I am with names...), is still alive and doing well. It had lost its antenna a long time ago but it still hangs in pretty much the exact same area where it was released in 2006. Except for the antenna, it doesn't look any different than it did over two years ago. It must have grown, but it still looks small to me. It is nice knowing that old friends haven't been eaten by sharks yet. 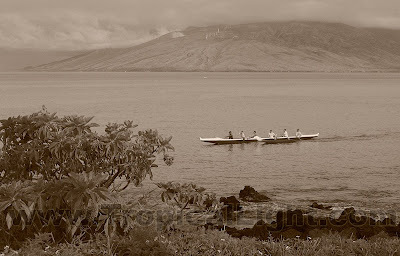 Boats gather daily in front of our house to drop snorkelers and scuba divers. Far out near the horizon cargo barges follow tug boats to and from the Big Island. But almost never do we see actual Ships near our beach. 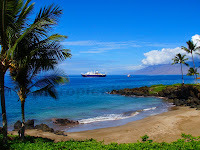 This week Maui is being tied in to the rest of the world via a trans-Pacific fiber-optic cable. Oh, and just beyond the ship I saw my first whale breach of the season. Maybe they're playing jump rope. 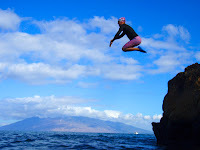 Excitement was in the air for the Maui Pink Cap Swimmers this morning. 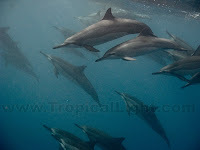 Recent sightings of Humpback Whales and Spinner Dolphins raised everyone's expectations of an interesting swim. 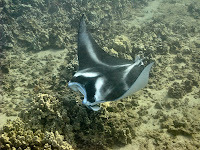 We encountered a Manta Ray on our way out and had fun trying to keep up with it. For those of you who enjoy a good romantic comedy, I highly recommend Nick and Norah's Infinite Playlist. 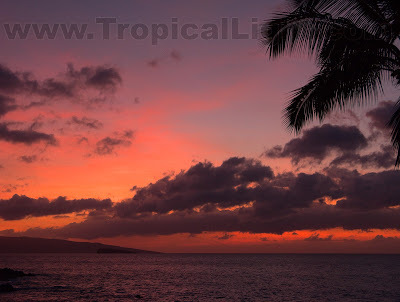 South Maui mornings are usually miracles of cloudless blue skies. Then the Makena cloud builds in. Today was the reverse and I was unsettled by the gloom. Definitely a good day to be working in black and white (or sepia). My grandfather Woveris had an interesting way with words, and he would have called this a Yogurt Class. Last year the Humpback Whales were playing mind games with me. They would lure me out into deep water then circle in behind me, keeping just far enough away to make a good photograph impossible. 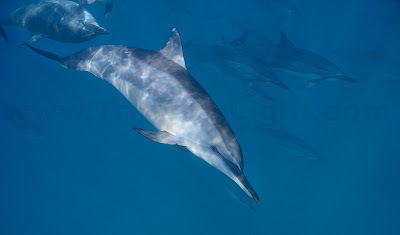 This morning a pod of Spinner Dolphins was getting me ready for upcoming whale season. Near the end of my ocean workout they did a quick swim-by. Just enough for me to get off these two grainy photos and nothing more. As I rested on the beach they returned and stayed, playing just far enough out that I wasn't tempted to try and reach them. But they stayed. And stayed. And stayed. Finally, I couldn't take it any more and swam out to meet them. I got about ten yards away from them and they turned and casually swam away up the current. What teases! Just in time, too. Whales were sighted both yesterday and today. Let the mind games begin. Even though I spent 4 hours in the car commuting (a HUGE deal on Maui) and the remainder of the day processing photos on the computer, I managed a dip in the ocean. Sometimes the hundred yard walk from my front door to the water is an unsurmountable obstacle, and it was looking that way again today. 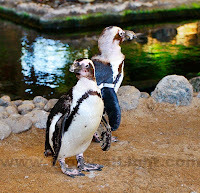 But watching these little penguins playing in the water (at the Hyatt where I was photographing) inspired me to do the same. The Tahiti Express ocean current was ripping along close to shore again this morning. It has been running strong for over a week now, and I think I've figured out how to beat it. If I swim right up against the rocky point, I get past it. Barely. I still ended up swimming in place for much longer than I like. Plus each wave threatened to throw me up on the jagged lava rocks and spiny sea urchins. So far, so good, though. 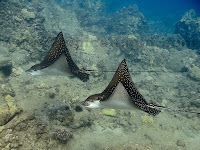 Because the current is so strong, the Spotted Eagle Rays have moved in closer to shore and up a ways. 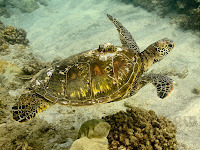 I got to swim with three of them this morning until I finally got tired of fighting the current. 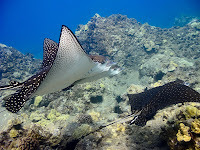 As I swam on, another ray flew past me riding the current, moving way too fast to get a photo. Bruce the White Tip Reef Shark was home today for the first time in a long time. Maybe the early morning hunting has been good. Click HERE or below for a very brief video of today's encounter. The pink cap swimmers did their thing this morning, the same way they always do, maybe even more so. Jonathan and Cheryl wanted to shake it up a bit and swim north for a change, so I joined them. 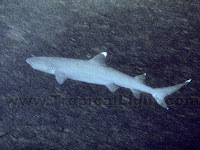 The creatures of habit swam south and missed a new jumping-off rock and two active white tip reef sharks. We got to play and swim and play and swim. I had a great time and am really glad I broke out of the usual routine. 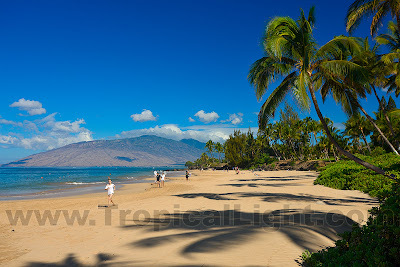 I continue wandering barefoot the beaches of South Maui. 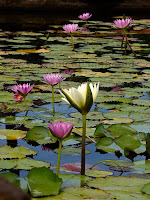 Taking postcard-worthy photographs is more difficult than it might seem. Still, it is nice being paid to spend my days on the beach. Maybe someday I'll get lucky and find an assignment to someplace exotic, like Minnesota. Sometimes the reefs look so barren. But when the water is warm and I'm alone, I slow down and spend time floating and watching. It turns out that all that ridiculous splashing which passes for my swim stroke frightens away the smaller fishies. When I stop churning up the water, they come out of hiding. I guess I could work on improving my technique, but I think I'll stick with floating for now.